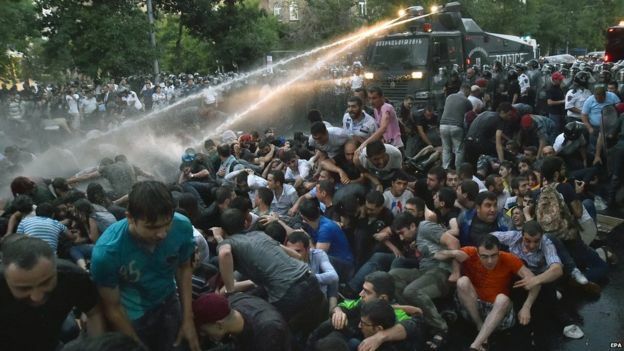 Thousands of people in the Armenian capital Yerevan have taken part in renewed protests against rising electricity prices. At least 6,000 made a second attempt to march to the presidential residence on Tuesday evening, reports said. Earlier, riot police with water cannon had dispersed a similar march and arrested about 200 demonstrators. Protesters are opposing a decision to increase electricity prices for households by 17-22% from 1 August. Armenia's electricity network is owned by a Russian company, which says the rise is necessary because of a fall in the value of the national currency, the BBC's South Caucasus correspondent Rayhan Demytrie says. 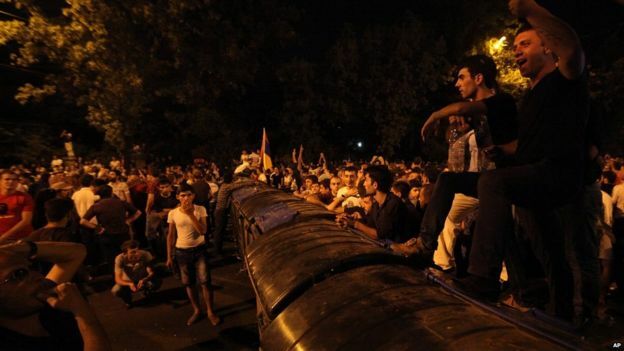 Witnesses said extra police were brought in late on Tuesday as protesters flooded Yerevan's central Freedom Square. Many waved national flags and chanted "Shame!" and "No to robbery!" They also demanded the release of those detained earlier on Tuesday. Officers in riot gear stood shoulder to shoulder to stop the crowd advancing towards the presidential residence. But early on Wednesday, protesters continued to fill the streets, witnesses said. The US embassy said it was concerned by reports of police violence and called for a full investigation. A spokesman for Russian President Vladimir Putin said the Kremlin was closely following the protests. About 5,000 people had taken part in the earlier rally that was blocked by police. Protesters then staged a sit-in and stopped traffic before being dispersed with water cannon.